One way transfer between Chengdu Shuangliu International Airport and your hotel in downtown. 1. Before getting to Chengdu, you are advised to find the information below via this site: http://orange-transfer.com/track-your-trip/. All information will be updated only 24 hours ahead of your arrival date. Upon arrival in Chengdu Shuangliu international airport, walk to the designated position as shown in the picture. There, you will meet our driver. In case you are unable to see our driver (this has never happened before), we strongly suggest you try the following procedure to get in touch with us. We will do our best to solve your problem on the spot. 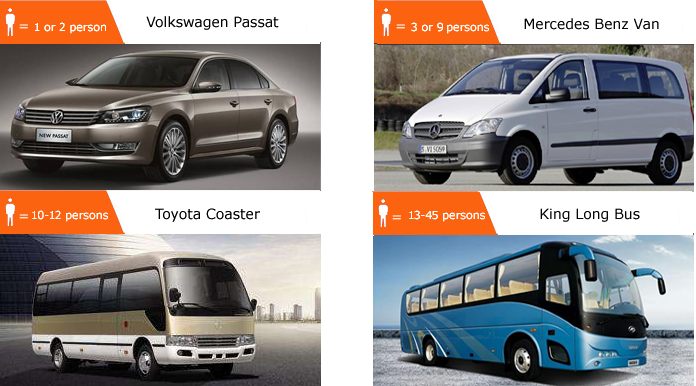 3, Compare with airport shuttle bus We are private transfer and customer will NOT need to wait for a fixed departure timetable. We are easy going, We promise to drop you off anywhere you point on Beijing map. Our van are with bigger space for you and your family, We will make everything smooth and easy.